Great lightweight jacket for those cool evenings! Q: does the women hoodies run big? A: We would suggest buying one size larger than you normally wear to be safe. They could shrink slightly. 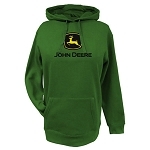 I LOVE my John Deere hoodie! I get so many compliments on it. 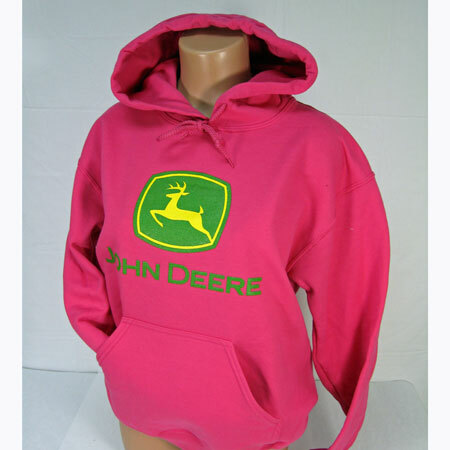 :) And I love that it is a dark bright pink. Runs a little small in the sleeves, so I would recommend air drying it. I got for my daughter in law and she loves it! I received my hoodie very quickly and I love it! The color is beautiful and it's very warm! Quick shipment, nice quality and a great fun color! 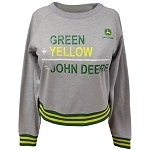 Fell in love with this when I first saw it...its the best "woman's" john Deere hoodie I have ever owned! Super happy I got it!! 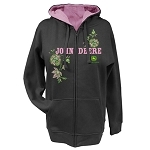 My niece wanted a boring green JD sweatshirt and I talked her into this hot pink one instead. Super cute, want one myself. The sizing is not perfect though; I bought medium and it seems kinda short & wide; hoping that it doesn't shrink in length or I'll be in trouble! VERY CUTE!!! A little bigger than I expected, but the pink is so bright. CUTE!! I love my new hoodie! Very true to size with no shrinkage! 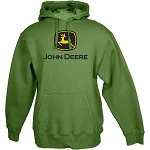 This has to be the most comfortable hoodie ever its super soft and super warm and everyone gives me compliments on it. a defiant must have. I got this for my daughter for christmas and it was a big hit!!!! She loves it and wears it everywhere. THis was a perfect gift for my daughter. 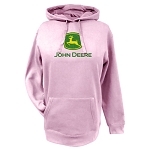 She loved the bright pink color and the quality was great! She alway gets comments about her hoodie.